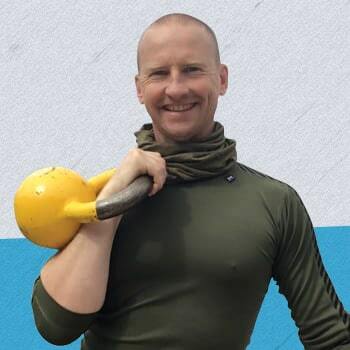 If you are new to kettlebell training or only have limited experience then this is the article for you. Below I’ve listed 5 beginners kettlebell exercises that you should learn before any others. Just mastering these 5 exercises will ensure the rest of your kettlebell training slots beautifully into place. Below I’ve also included 4 x 4 minute kettlebell workouts that you can use to practice the exercises. First on the list is the kettlebell slingshot. The slingshot is a simple exercise that involves passing the kettlebell around the body from one hand to the other. The slingshot is a great starter exercise because it helps you to acclimatise to the kettlebell weight as well as working the shoulders, core, and grip. Later on in your training you will use the kettlebell slingshot as an exercise to catch your breath between other exercises or as a warm up before your main workout. Practice: 10 repetitions one way and then change direction and 10 repetitions the other way. Work up to 20 reps in each direction. The kettlebell halo is the next beginners kettlebell exercise you should know. 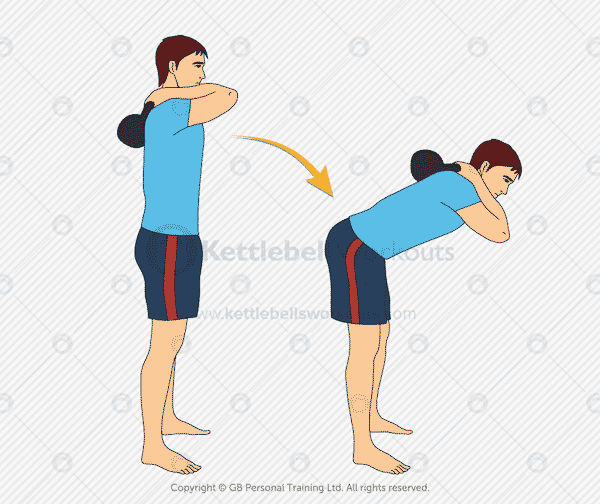 The exercise involves taking the kettlebell around the head closely following the perimeter of the neck. 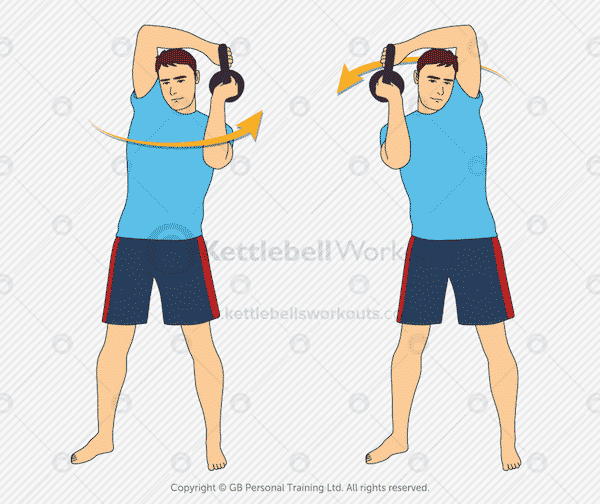 The kettlebell, during this exercise, should be kept nice and close to the neck and taken around the head in a nice rhythmical motion. The kettlebell halo works deep into the shoulders and the whole of the upper body. Again, like the slingshot exercise, the halo will be used later in your training both as a warm up exercise but also as an active recovery exercise in between other exercises. Practice: start with 5 in one direction and then change and 5 in the other direction. Work up to 10 alternating repetitions in each direction. A slightly more tricky kettlebell exercise next. The kettlebell good morning is not too demanding but it does require good body mechanics. With the kettlebell held behind you with two hands against the mid back the body hinges forwards at the hips keeping the lower back flat. The kettlebell good morning teaches you to hinge at the hips without arching the lower back and at the same time mobilising the hamstrings and hips. As you hinge forwards you take a nice breath OUT and then as you return to the upright position you breathe in again. Like the slingshot and halo, the good morning will later be used as more of a warm up based exercise or as a filler exercise in between others while you rest. Practice: start with 5 repetitions, practicing your breathing and keep your back flat. Work up to 10 smooth reps. Probably the most important kettlebell exercise for beginners is the single arm deadlift. For this kettlebell exercise the weight is picked up off the floor using the hip hinge movement pattern. The back is kept beautifully flat as the legs, and buttocks do all the heavy lifting. 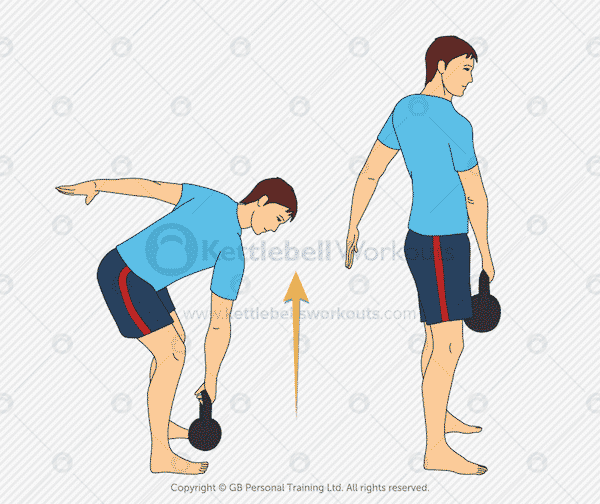 The kettlebell single arm deadlift is a full body exercise that uses most muscles in the body but more importantly coaches the hip hinge movement used later for the kettlebell swing. Keeping your weight on the back half of your feet and not wearing shoes with raised heels will help dramatically with the movement and muscle activation. Practice: start with 5 repetitions on each side moving slowly and deliberately. Work up to 15 beautiful reps on each side. Finally we move onto the kettlebell goblet squat which involves squatting nice and deep while holding a kettlebell at chest height. The squat is very important movement pattern for daily life and uses most muscles in the body, in particular your buttocks and legs. It is important during the squat that you go down deep enough so that your thighs are parallel with the floor. If your squat is too shallow then you will not activate your buttocks and will over develop the thighs. If you find deep squats demanding then you should practice without the kettlebell first. A good squat without a kettlebell is worth a lot more than a badly performed squat holding one. You can hold onto a pole, TRX, or resistance band attached in front of you to help strengthen the movement pattern before adding a kettlebell. Just like the deadlift above, keeping your weight on the back half of your feet and keeping your chest up will help dramatically. 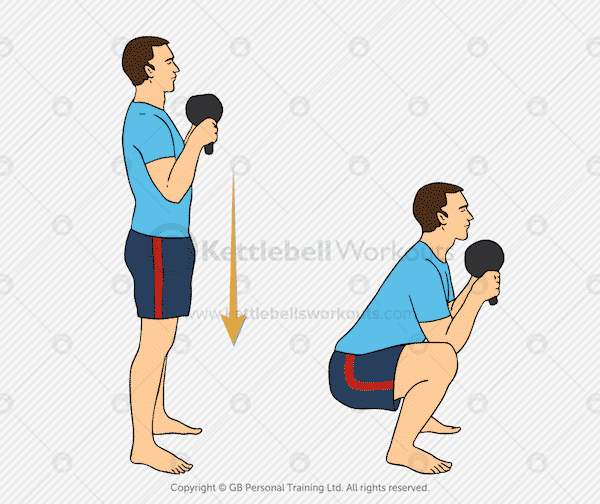 Practice: work on getting your squats nice and deep first before adding a kettlebell. Work up to 20 total reps holding a kettlebell. Now we have listed the 5 beginners kettlebell exercises lets put them together into a few 4 minute workouts. There are 4 workouts listed below each lasting only 4 minutes. At first just follow along with each workout for the 4 minutes. Once you have mastered the workout rest for 30 – 60 seconds and repeat it for a total of 3 times. Once you can perform workout 1 for a total of 3 circuits then move on to workout 2 and so. Do not progress onto the next workout until you can perform 3 circuits. Woman should start with an 8kg (18lbs) or 12kg (25lbs) size kettlebell. Men should start with a 12kg (25lbs) or 16kg (35lbs) size kettlebell. Perform a workout 3 – 5 times per week. Kettlebell training can be confusing and is very different from other types of resistance based training. Making sure that you begin with the correct exercises to build a solid foundation for future exercises is very important. Above I’ve highlighted 5 kettlebell exercises that every beginner should start with and then 4 kettlebell circuits that you can use to practice them. Become masterful at these 5 kettlebell exercises and the 4 workouts. Not only are these workouts great building blocks for the future but they are also highly effective in and of themselves. Hi Greg, I’ve already lost 6 stone and along my journey I have added various exercises to my routine, it’s only recently I found kettlebells and feel confident enough to start and lose the remaining 4 stone I need to thanks to your website and all the exercises, I know that I can follow the plans safely now I have your excellent tutorials to follow, thank you so much for all the hard work you put in to helping people. Congratulations on your successful fat loss, keep me updated on your future results and let me know if you ever need anything. Greg, this is awesome. I’ve just picked up my first kettlebell at the gym today and worked through three circuits of workout one with a 12kg kb. Pleasingly I found that it wasn’t overly challenging so it is great to start building confidence with the kettlebells. It’s so much nicer than using a barbell that I can hardly describe it! Heart rate was up and stayed up so this is a definite winner for me. On to workout two. Brilliant, well done Jason, keep up the good work! 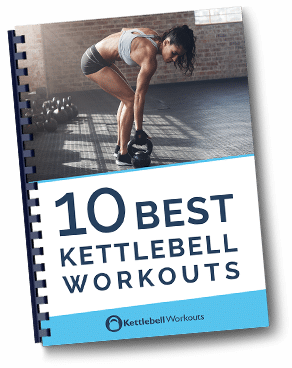 I’m a beginner & a bit confused which exercise set to follow, the 5 exercises & workouts listed above or the ones int the 10 Best Kettlebell Workouts in the download? Would really appreciate it if you could let me know. Start with these 5 Tony and then progress to the 10 Best Kettlebell Workouts Download. In “Good Morning” exercise, you write “As you hinge forwards you take a nice breath OUT and then as you return to the upright position you breathe in again.” I think it is mistake. 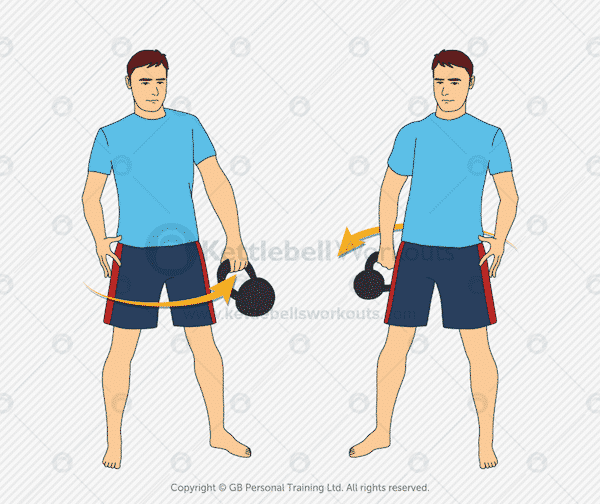 When we do powerful “push” such as kettlebell swing out (from the bottom position), or squat stand-up (from the bottom position), we need to exhale, powerfully, even involving some voice (to increase pressure in lungs & to involve ABS and all core muscles). And when we do less-powerful opposite (such as hinge forward, or swing down, or squat down) we should do more relaxed inhale. These are amazing for beginners and not only: as a great warm-up. And it is only warm-up!!! 3 minutes rest between sets (started with 4); I can increase to 2 minutes, but now more. I feel muscles got hit on 2nd and 3rd day (especially legs). 2) after 5-6 minutes rest, I do *perfect* swings with 20kg, 5 sets of 10-12, with 2 minutes rest. So, now, the question is: of course I can decrease weight and decrease interval between sets… but then it will look like cardio. I can just run with no weight, and zero-weight kettlebell. Same as swing with zero weight and 2000 reps indeed, what is the benefit then? Note Workout 1 is just warm-up to me, and and I cannot move to higher weight because of arms (Halo). And my breathing becomes so rapid at set 2 and 3 that I do 2-breath-in-out for 1 squat, so that it is hard enough workout for me, and I need 3 (al least 2) minutes rest between workouts. I am 53. Hi.Love your suggestions.I am from Puerto Rico a Caribbean island.I had been doing k/b on my own cause I don’t know nobody who give training here..As a fact I am the only one in my gym who use the K/b. I swing with a 20 pounds k/ b and sometimes with a 35 pounds.I do a routine of 1 hour once a week. All my routines are from Instagram and now you.I am a 61 years vegan lady who fall in love with the k/b.My goal? Do the Turkish movement from the floor and up.Since 2 years I have been doing k/b I still afraid of doing it without making the ridiculous.Thanks for your post. Great exercises I’ve just started using kellbells after many years without going to a gym, and these are very good for getting me back into the swing of things – I only have a 10kg weight but its proved a good starting point as I am 52 but I am already varying the beginner exercises with others to spice things up a bit – moving onto a 16kg soon. I really like the kettlebell its very suitable for exercise at home and these are very easy to fit into a busy life. I am 66 now; I have a 20#, 25# and a 35# kettlebell set. I have tried to do too much with them, and I quit until now. Awhile back I bought a 10#..and that’s what I will start with, with the 5 exercise set to hopefully re-build my skills. I have NO access to a local trainer in this area, so I am on my own to re-learn what I did know, to resume using kettlebells. I’m 30-35 pounds overweight, I am active, swim daily at a local pool, during adult swim time. And I walk a lot. I just want to get in better shape for daily living. And, now and then, I do charity 5Ks. Thanks for the workouts. I have been looking for lightweight exercises to start with since i had major abdominal usrgeries several years ago. This will work great buidling my core back. I would like to start getting fit again, but I can not do squats because I have bad knees(misplaced knee caps). Do you know of any exercises that I can do in place of squats? So glad to see this question and the follow up answer. I too have bad knees and am a beginner to k/b. So excited to get started! I have started with Kettlebells and am currently on the 2nd circuit. I had a question, I can see that in the 1st circuit there are 10 bodyweight squats and in the 2nd there are 20 which is a good progression but the 3rd has again 10 bodyweight squats while the 4th has 20 goblet squats. Was just wondering if the 3rd should have 10 goblet squats as that sounds a better progression. Hi Arunava, I’m pleased to hear you are enjoying the 4 minute circuits, yes the progression is correct due to the active recovery in between the 10 goblet squats. Ive just bought a 6kg kettlebell and am not sure if its too heavy as I am new to ketlebell workouts. Would a 4kg be too light ? Hi Jo, I’d usually recommend an 8kg kettlebell due to the full body exercises you will be performing but a 6kg will be a good start. I’m excited to begin but nervous about the Goblet Squats. I had my left knee replaced last September and can bend it but I’m not sure about doing squats. Suggestions? I completely understand Kathy, you will want to start without the kettlebell for the squats. I’ve written more on fixing bad knees here. Currently I have a 5lb, 10lb, 15lb kb should I do these exercises with the 15lb kb? Yes Tamiko the 15lb kettlebell would be a good start. I’ve got more on the correct size kettlebells to use here. Hi Greg…great site, cant wait to get started…. just want to clarify something first. On day one I am to do circuit 1, 3 times yes? (Ie for a total of 12mins, not including any rest period) ….if I can do that then I move straight on to circuit 2, 3, 4 etc….. So theoretically the workouts will total 48mins (minus rest periods)… Ie 12mins per round (4mins per circuit x 3reps) x 4 circuits = 48mins, yes? thank you!! Almost Laura, when you can complete circuit 1, 3 times move on to circuit 2 on the NEXT day. So no more than 12 minutes per day. Year past surgery (aortic aneurysm), 72 male….new to kettleball. Just now achieving 10 push ups in the morning, and 10-15,000 steps per day. I think kettleball will suit me perfectly. Should I start with 12 kg and same routine as provided here? Hi Mike, yes these 5 exercises are a good place to begin. Take it steady and see how you get on. The 12kg will be easier for some exercises, deadlift, and more difficult for others, the halo. Enjoy! Hey, this is amazing thank you for this. I just have one question as I am very new to reps and circuits. So that would be 3 reps each workout 1-4 per day? Yes Zark you would repeat each circuit up to 3 times. When you can comfortably complete the circuit 3 times you can then move on to the next workout. Everyone responds to exercise differently so you can try 5 times per week and see how you feel. Take an extra day off if you need too.